When you need an SUV with a little bit of attitude and a rebel spirit that doesn't shy away from an adventure, the automakers at Jeep have the perfect off-road vehicle the 2016 Renegade. This subcompact SUV comes with all the powertrain and performance of a regular size Jeep packed into a smaller and versatile car-like body that embraces the rough terrain as much as a smooth highway. If a Jeep is what you are after, there may be no better place to visit than Lakeland Dodge in Lakeland, FL, where our dealership remains one of the best places to buy a car in the entire area. Our expert team of representatives are ready and waiting to get you into the 2016 Jeep Renegade today! There are plenty of reasons to purchase a Jeep Renegade and versatility clocks in as one of the primary reasons. 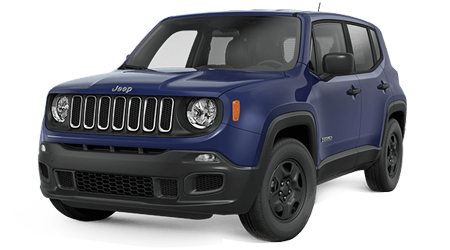 A full-size crossover SUV may not be the right choice for every car buyer, and for those that would love to experience the all-around excellence of the Jeep brand name, without opting for a larger version, the 2016 Renegade is the perfect option. The compact SUV provides a truly unique SUV option and those free spirits who want to stand out wherever they go, this is the vehicle to see. At Lakeland Dodge we proudly serve patrons from the Wesley Chapel, Tampa, Brandon, Wauchula, Brooksville, Orlando, St.Cloud, Kissimmee, and Winter Haven areas with a team of knowledgeable and friendly sales people who want nothing more than to get you a great deal. Visit us at 2335 Highway 98 N, Lakeland, FL 33805 to schedule a test drive in the 2016 Renegade today! We look forward to serving you.